Welcome to the new, online home of the Conemaugh Township Area Middle School and High School Indians! Since our beginning, we’ve been a true focal point for the entire community. To promote communication, we’ve designed our website as a tool to aid students, faculty, parents, and community members in the communication process. Yearbooks are now on sale! Order a copy today. We only order a limited number of books and once they are gone, that’s it. Don’t miss out! We would also love your help in bringing this yearbook to life. We're looking for photos of everyday school life, activities, and events. While we cannot guarantee that all shared photos will get published, if you don't share, your great pictures can't even be considered. So, what are you waiting for? Start sharing today! For information on how to order your yearbook and share your photos, please view the flyers below. 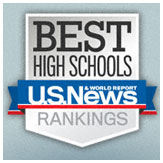 U.S. News and World Report Best High Schools Bronze Medal Award Winner 2010, 2012, 2015, 2017.